Paul Pogba will miss today's Manchester derby through suspension. PAUL POGBA HAS proven to be a divisive figure in recent weeks, and even after Man United’s 3-1 victory over Arsenal last Saturday, in which he set up two of his side’s goals. There are two schools of thought on the French midfielder. There is the view put forward by some pundits, such as Graeme Souness and John Giles, that for all his talents, he comes up short in certain respects and has struggled to live up to his €105 million price tag. On the other hand, there are critics who believe Pogba is a key player and that United are a significantly better side with him in the team — Paul Scholes is one person who subscribes to this view. A close analysis of the Frenchman’s performance at the Emirates last week sheds some light on the 24-year-old’s strengths and weaknesses. One viewpoint is that the player lacks the tactical discipline to be an out-and-out midfielder who runs the game in the manner of world-class players in the position such as Real Madrid’s Luka Modric. There is a degree of truth to this claim. Pogba has played in a defensive midfield role before — he struggled to make a considerable impact when put in this position for the Euro 2016 final, for instance, as explained in detail here. For United, he has been given licence to play in a more attacking role. Last Saturday was a perfect example. Notice, in the clip below, how high Pogba is positioned up the field early on in the game. Pogba’s responsibility appeared to be to break up Arsenal attacks at an early stage and prevent them creating forward momentum. Pressing Arsenal deep in their half was a key part of the visitors’ strategy early on and it paid dividends. United scored twice in the opening 11 minutes to stun the hosts, who were perhaps expecting the Red Devils to sit back and soak up pressure, as Mourinho’s sides have done to varying degrees in previous big games this season against Chelsea, Tottenham and Liverpool, with mixed success. On this occasion, the high pressing clearly caught Arsenal off guard. For both goals, the Gunners were pressured into giving the ball away, with Laurent Koscielny and Shkodran Mustafi made to pay for misplaced passes by United’s clinical attack. Pogba had a hand in the first goal, playing a one-two with Antonio Valencia, before the full-back struck the ball powerfully through the legs of Petr Cech. For the next 79 minutes after United’s second, Arsenal were the dominant team by and large. The statistics reflect that assertion — according to the BBC, they had 75% possession and 16 shots on target in comparison to four for their opponents. Critics will undoubtedly cite this factor as further evidence that Pogba struggles to control games and that United, for all their attacking prowess, are destined to be second best in midfield against the top teams. But surely Mourinho knows well by now that the 24-year-old will never to be the Xabi Alonso-type figure that so many critics seemingly feel he should be. He is not a natural midfielder in that sense. Instead, a better comparison would be to Steven Gerrard — not the most tactically disciplined player in the world, but someone whose pace, power and athleticism compensates for flaws elsewhere. There is surely room for such a player in the team and Mourinho has likely identified how best to use the France international. That said, the strategy of playing him so far forward undoubtedly left United vulnerable at times. When he failed to break up the first point of attack, the visitors were left looking very open and vulnerable to the counter. One pass could always take Pogba out of the game and leave United exposed. For the most part, Matic sat and protected the back four, giving them a degree of protection. Occasionally though, both the Serbia international and Pogba ventured forward and Arsenal really threatened to do some damage on the counter-attack in these instances. Mourinho was clearly concerned despite his side’s 2-0 lead. He had a word with Pogba during a break of play, seemingly emphasising the importance of either the French star or Matic sitting back at all times when United were attacking. Pogba also did not show a desire to dictate the game. Check out the clip below. A Roy Keane or Patrick Vieira would always demand the ball to feet in this instance. 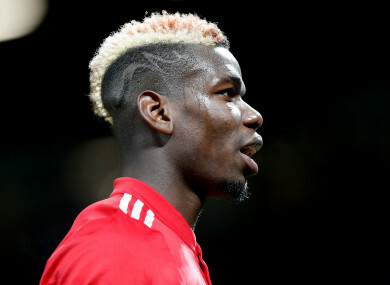 Pogba, though, is happy to let his centre-back Chris Smalling hopefully boot the ball forward rather than trying to play in a constructive fashion. This habit partially explains why United ended the game with just 25% possession. There were moments, too, where Pogba failed to sense danger quickly enough and allowed Arsenal plenty of time and space to play. Check out the clip below, where he only belatedly tracks Mesut Ozil when the German international gets hold of the ball. Yet while Pogba’s performance defensively was far from perfect, he was key in another sense. The Frenchman was consistently excellent at driving forward and starting counter-attacks. His primary role was to provide a link in the transition from defence to attack. As the screenshot below indicates, himself, Jesse Lingard and Antonio Valencia were expected to get forward at will in support of Anthony Martial and Romelu Lukaku. Few if any United players were expected to do as much running as Pogba, which perhaps partially explains why he looked a little bit sluggish at times, particularly in the moments where he was required to defend. A perfect example is Arsenal’s goal. A lapse of concentration from Pogba allowed Aaron Ramsey to drift in behind him unmarked and set up Alexandre Lacazette, who finished with aplomb. The screenshots below illustrate Pogba’s mistake. There were times, even after Arsenal’s goal, where Pogba was starting to look like a liability. As Arsene Wenger’s side’s attacking momentum grew, the ex-Juventus star frequently found himself behind the play and not affording adequate protection to his backline. More and more in the second half, Lingard appeared to be the one afforded greater defensive responsibility in the central area alongside Matic, with Pogba practically playing as a makeshift number 10 at times. Notice the clip below where, apart from Lukaku, he is the furthest player forward — and remember that this is the period of the game where, at 2-1, United are really under the cosh. This point is not necessarily a criticism of Pogba – perhaps he was simply following instructions. After his mistake for the Gunners’ goal, whether by accident or design, he was playing increasingly far forward. Whatever the strategy, it worked. For the crucial third goal, the France international was at his best, gliding past the challenge of Koscielny, before providing the perfect cross for Lingard to tap home. It was a classic smash-and-grab display by United, after goalkeeper David De Gea had played an integral role in weathering the Arsenal storm. Even at 3-1 though, Pogba continued to storm forward. Mourinho may not have been overly pleased with this rather adventurous approach, and he will undoubtedly have been frustrated shortly thereafter, when Pogba was deservedly sent off for a nasty late challenge on Hector Bellerin. Without Pogba, one legitimate penalty claim aside (when substitute Matteo Darmian brought down Danny Welbeck), United were largely untroubled for the final 15 minutes and defended their lead much more assuredly than they had done in the first half. The key question, now, is whether Pogba’s absence will be felt in today’s Manchester derby. The Red Devils have arguably suffered in the player’s absence before this season. They have won seven out of eight Premier League games in which he has featured. In seven top-flight matches for which he has been missing though, they have drawn one and lost two. In the clashes with Chelsea, Liverpool and Spurs, Pogba’s absence was particularly noticeable. Even though United ended up taking a respectable four points from these fixtures, their attack was consistently below-par, scoring just once in the three games and registering only one shot on target against Liverpool. United may have been defensively solid without Pogba, but they did not possess the dynamism on the break that was frequently evident in the Arsenal match. The best position in which to play Pogba is perhaps still up for debate, but the evidence of results so far suggests the Red Devils are a more potent force with their record signing in the team. Email “Analysis: Is Paul Pogba overrated or underrated?”. Feedback on “Analysis: Is Paul Pogba overrated or underrated?”.